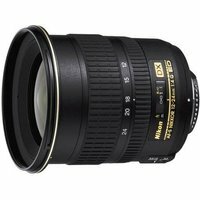 The Nikon 12-24mm autofocus zoom lens with f/4 maximum aperture is designed expressly for use with Nikon digital SLR cameras. Its design features 2 Extra-Low Dispersion (ED) glass elements and 3 aspherical lens elements for superior optical performance. Includes HB-23 Nikon lens hood.